Jordan Moore has joined Ola Adeyemo in leaving Dundee United as manager Mixu Paatelainen begins a clearout of the squad inherited from Jackie McNamara. Moore battled against skin cancer to return to football, but the 21-year-old has joined fellow striker Adeyemo in leaving by "mutual consent" this week. He told United's website: "It is time to move on and progress my career. "The club has done so much for me, but I want to go away from Scotland and be known for just my football ability." Moore, whose cancer battle was extensively covered in the media, failed to break into the United first team. But he has scored 11 senior goals during loan spells with Airdrieonians, Dunfermline Athletic and Queen's Park. He said he would always be "grateful" to United and hoped to return to the club some day. 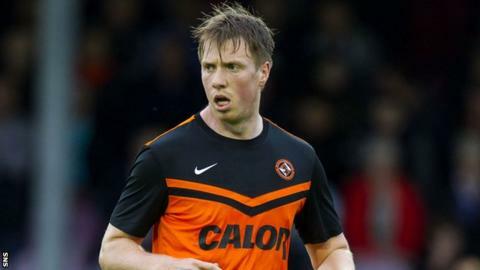 "Wearing the number nine shirt for Dundee United had been my career high and I would love to be back at Tannadice in the future scoring goals for the club I have supported all my life," said Moore. "That remains my dream. "The fans have also been unbelievable with me and this club will always be a big part of me." Adeyemo made only two substitute appearances for United since arrived from University College Dublin in 2014. He spent a loan spell with East Fife at the end of last season, making 12 appearances for the Scottish League Two side.